Panthéon-Assas is renowned for excellence in law and often described as the top law school in France. It is considered as the direct inheritor of the Paris Law School (1257-1970) since most of the latter’s law professors (88 out of 108) went to Panthéon-Assas and its main campuses are the same ones of those of the Paris Law Faculty (i.e., Place du Panthéon and rue d’Assas), from which its name comes. It currently provides law courses for the Sorbonne University and may become its faculty of law. Since its founding in 1971, it has produced two presidents, four prime ministers, and the holders of thirty-seven other ministerships in France and around the world. Forty alumni of the university have been members of various parliaments as well. 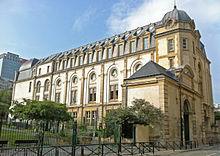 When the University of Paris (nicknamed "the Sorbonne"), which had been founded in the middle of the 12th century, and which officially ceased to exist on 31 December 1970, following the student protests of 1969, the Faculty of Law and Economics of Paris professors had to choose the future of the university. Most of the law professors of the faculty of law and economics wished only to restructure their faculty into a new university. In pursuit of this, they founded with one professors of economics founded the "University of law, economics and social sciences of Paris" or "Paris II". Hence, it is generally considered as its direct inheritors. Some law professors went to other universities inherited from the Sorbonne. The official name of the university was changed to "Panthéon-Assas (Paris II)" in 1990. The name Panthéon Assas is a reference to the main addresses of the pre-1968 faculty of law of Paris, which are now part of the university; namely, the buildings on place du Panthéon and rue d'Assas. The university is also referred to as "Assas" or "Paris II"[not in citation given] and "Sorbonne Law School". Panthéon-Assas is providing law courses for the Sorbonne University and may become its faculty of law. Location of the university's main campuses within Paris: Panthéon (1), Assas (2), Vaugirard (3), and Charcot (4). The university has 18 campuses in Paris and one in the city of Melun. The administration offices and postgraduate studies are located in the structure designed by Jacques-Germain Soufflot and built in the late eighteenth century for the faculty of law of the University of Paris, on the plaza that rings the Pantheon; the building is shared with Panthéon-Sorbonne University. It is registered among the national heritage sites of France. The largest campus of Panthéon-Assas is located on rue d'Assas and receives second-year to four-year law students. It was designed by Charles Lemaresquier, Alain le Normand and François Carpentier to accommodate the growing number of students at the University of Paris. It was built between 1959 and 1963 on the former grounds of Société Marinoni. At the time of its inauguration, its main lecture theatre was the vastest in France, with 1,700 seats; several concerts have been held in it, featuring Herbert von Karajan, Leonard Bernstein, Georg Solti, Elisabeth Schwarzkopf, Dietrich Fischer-Dieskau, Martha Argerich, Gundula Janowitz, Christa Ludwig, Alfred Brendel, Arthur Rubinstein, Seiji Ozawa, Carlo Maria Giulini, or Samson François, among others. The scene at the Cairo airport from OSS 117: Cairo, Nest of Spies was filmed in its entrance hall. The campus on rue de Vaugirard gathers first-year students. It is located in the chapel wing of the defunct Jesuit College of the Immaculate Conception, where Charles de Gaulle had been a pupil; the chapel itself, dating from the eighteenth century, was transformed into a lecture theatre in the 1980s. The structure is a national heritage site as well. The campus on rue Charcot receives third-year and master students of economics. South-east of Paris, the campus in Melun, which opened in 1987, gathers over a thousand first-cycle students who do not reside in Paris. The campus in Melun hosts local first-year students. It is located in the old town of Melun, on Saint-Étienne Island, among Roman and Gothic remains. The Institute of Law and Economics of Pantheon-Assas University is located there. Assas building, which was going under renovation during the last ten years, has been completely redesigned and now hosts a modern learning center. The campus in Melun also has an extension under work. The university houses five academic departments: one for private law and criminal sciences, one for public law and political science, one for Roman law and legal history, one for economics and management, and one for journalism and communication (administered by the French Press Institute, which was incorporated into Paris II in 1969 serving as the later's department for communication and journalism studies). [a] In all, Panthéon-Assas comprises about two dozens of research centres, including the Institute of Higher International Studies, the Paris Institute of Comparative Law, and the Paris Institute of Criminology. In July 2012, Panthéon-Assas became the first university in France to open preparatory classes for the bar school entrance examination, which were until this point the monopole of private preparatory schools. In 2013, the university set up a distance learning degree in law. Panthéon-Assas is governed by an administration council, a scientific council, and a council for studies and university life. Members of these boards serve two year terms. The president of Panthéon-Assas is elected by members of the administration council, for a four-year tenure; he or she presides over this council. The president is assisted by two vice-presidents and several professors elected within their respective academic departments. Members of the administration council choose the faculty representatives who make up the scientific council. The undergraduate law program of Panthéon-Assas is selective, with an acceptance rate of 14%. The first-year pass rate in law hovers around 40%. All French universities are legally obliged to allow students to change universities and curriculums after the first semester of their first year. However, they are allowed to accept as few or many students as they like; Panthéon-Assas accepts only 3% of transfer requests. Admission to the second year of the university's master programs is selective as well, some of these programs admitting only 1.7% of applicants. The campuses at rue d'Assas, rue de Vaugirard and Melun host the university library, which is open to all the students. The university's research centres, institutes and reading rooms host twenty-two more specialized libraries. The total seating area of the university's libraries spans over 3,400 m2, and the university's collections gather over three hundred thousand volumes together. Students of the university also have free access to Cujas Library, which is the largest law library in Europe and which is co-administered by Panthéon-Assas and Panthéon-Sorbonne. Assas has cooperation agreements with 315 partner universities, including 113 Erasmus+ partners. In 2013, about €1.3 million from the annual budget of Pantheon-Assas were dedicated to research. The university's publishing house, Éditions Panthéon-Assas, was established in 1998. Panthéon-Assas hosts several faculty-led publications in French: Jus Politicum ("Political Law") since 2008, the Revue de droit d'Assas ("Assas Legal Journal") since 2010 and Droits fondamentaux ("Human Rights") since 2012. They are all available online. It also hosts a faculty-led publication in English, the Sorbonne-Assas Law Review, since 2012. Panthéon-Assas offers several joint undergraduate and graduate programs with other French universities and institutions such as INSEAD, Panthéon-Sorbonne University, Paris-Sorbonne University, Pierre-and-Marie-Curie University, Paris-Dauphine University, ESSEC Business School, HEC Paris, or École Nationale Supérieure des Mines de Paris. The university offers international joint programs as well. It created in 2011 the Sorbonne-Assas International Law School which have campuses in Paris, Singapore and Mauritius. Since 2013, Panthéon-Assas, ESSEC Business School, and Yale Law School organise in Paris a summer school in law and economics, the Yale-Paris II-Essec Summer School. Officially not allowed by the Law to choose its students for its undergraduate degree like all universities in France, Panthéon-Assas developed a number of internal degrees in addition to the global undergraduate degree, like the College of Law and the Paris Law School. A lot of universities followed its steps. Panthéon-Assas University is ranked first in the Eduniversal rankings. In QS World University Rankings, based on English speaking publications, the university is ranked 3rd in France and 101st-150th worldwide. It is often described as the "top law school in France". Assas' undergraduate law program is ranked first by Eduniversal, the only one with 4 stars. It was also ranked first in the interdisciplinary degree Law and English. Its best-ranked master's degree is ranked 4th of Europe (1st of France) by Eduniversal. Most of the students admitted at the French National School for the Judiciary come from Panthéon-Assas, more than 40% in 2011 (people who went to Assas Faculty of Law and then passed the exam from elsewhere not included). According to "capital.fr", Assas graduates have the highest salary of all French law schools. Assas undergraduate program has been ranked seven in 2016 by Eduniversal. Assas has reputation of "excellence" in Law and cultivates its own image of being "the top law school in France". Le monde des grandes écoles et des universités called it a "symbol of Made in France excellence". The French Research and Higher Education Evaluation Agency stated in 2013: "Paris II University presents itself as a university of excellence. This claim is not abusive. The university occupies – in Paris, in France, in the European Union and, more broadly, in the international scientific community – a prominent place. The university's reputation and notoriety has not been usurped. They are based on teaching and research activities as well as publications whose quality is recognized and celebrated in academia. And this beyond frontiers." Faculty members have included two French ministers, four members of the French parliament, two members of the European parliament, a member of the Constitutional Council of France, a president and four members of the Académie des sciences morales et politiques, a member of the Académie française, a member of the Académie des inscriptions et belles-lettres, a president, a vice-president and a member of the Supreme Court of Monaco, and a secretary general of the Institute of International Law. Jean Carbonnier, who renewed huge parts of the French Civil Code in the 1960s and 1970s, and especially family law. Gérard Cornu, who wrote the new French Code of Civil Procedure in the late 1970s and is also well known in France for his Dictionary of Legal Vocabulary, translated in English. Serge Guinchard, head of the first Judicial Studies Institutes of France (in Panthéon-Assas) in the 1990s and head of several governmental commissions for criminal procedure and criminal law reforms in the 2000s in France, Senegal and for the Council of Europe. François Terré, president in 2008 of the legal section of the Académie des sciences morales et politiques, head of the private committee for the reform of French Law of Obligations. In the judiciary field, outside France, alumni of Panthéon-Assas have included a chief justice of Brazil, a judge of the Constitutional Court of Italy and a former vice-president of the International Court of Justice, two former chairmen of the International Law Commission, an advocate general at the European Court of Justice, two chairmen of the International Arbitration Institute, a former president of the Greek Council of State. Alumni of Panthéon-Assas have held important positions in the French and international political spheres. In France, two prime ministers, three ministers of justice, three ministers of the interior, two ministers of defence, two ministers of labour, two ministers of finance and one minister of the environment have been alumni of the university. Twenty-nine members of the French parliament and five heads of French political parties have earned degrees from Panthéon-Assas as well. Alumni have also held twenty-two foreign ministerships, while fifteen alumni have filled seats in foreign or supranational parliaments. Alumni have also held twenty-two foreign ministerships, while fifteen alumni have filled seats in foreign or supranational parliaments. The president of Greece and the first female president of the Central African Republic are also alumni of the university. To this day, Panthéon-Assas has been governed by nine presidents. The founding president, Berthold Goldman, a jurist, was succeeded by Jacques Robert, former member of the Constitutional Council of France, who was followed by Jean Boulouis, a private law jurist. Next came another private law jurist, Georges Durry, followed by Philippe Ardant, former president of the Constitutional Court of the Principality of Andorra and former president of the Arab World Institute. Panthéon-Assas was then presided by Bernard Teyssié, a specialist in social law, who was succeeded by Jacqueline Dutheil de la Rochère, a public law jurist. She was followed by Louis Vogel, a private law jurist. He implemented numerous innovations, the aim of which has been to adapt the education given at the University of Paris to the needs of the 21st century. He was elected head of the Presidents of Universities of France Society in 2010. Guillaume Leyte, a legal historian, was elected president of the university on June 20, 2012, and reelected in 2016. ^ The Savary bill of 1984 aimed at centering universities on "education and research units" (French: unités de formation et de recherche) which match academic departments— offering both undergraduate and graduate programs—to research centres. Panthéon-Assas comprises six of these units: one for first cycle and basic legal qualification in law and political science, one for second and third cycles in law and political science, one for economics and management, one for private and public management, the French Press Institute, and the Institute of Judicial Studies. ^ a b "Rencontre avec 4 universités d'excellence - Monde des grandes écoles et des universités". 22 February 2012. Retrieved 26 December 2016. ^ "Les programmes de I à VII" (in French). 1970-06-24. Retrieved 2019-02-09. ^ "Université Panthéon Assas - Adresse Paris 2 - Cours Droit, Science politique, gestion....Master, licence - La Chancellerie des Universités de Paris". Retrieved 26 December 2016. ^ "Insead and Sorbonne launch joint business and law degree". Retrieved 26 December 2016. ^ a b "Insead resorts to the law". Retrieved 26 December 2016. ^ Arrêté du 6 janvier 1926. ^ a b Hottin, p. 206. ^ Le Ray, p. 24. ^ L'Événement du jeudi; L'Express; Orchestre de Paris; de Brancovan (January & April 1973); Le Nouvel Observateur, p. 40; Bellamy, p. 264; Genette; Bras, p. 49. ^ Arrêté du 2 octobre 1990. ^ "Melun : l'extension de l'université ouvrira « probablement » en 2017". 26 December 2016. Retrieved 26 December 2016. ^ "Universités partenaires - Université Paris 2 Panthéon-Assas". Retrieved 26 December 2016. ^ "Revues en ligne - Université Paris 2 Panthéon-Assas". Retrieved 26 December 2016. ^ "Sorbonne-Assas Law Review - Paris 2 - Panthéon-Assas University". Retrieved 26 December 2016. ^ "About the School – Sorbonne Assas – International Law School". Retrieved 26 December 2016. ^ "QS World University Rankings 2015". ^ "ULB - Les Etudes". Retrieved 26 December 2016. ^ "INSEAD Lends Business Expertise to France's Top Law School". Retrieved 26 December 2016. ^ Bates, Daniel (15 December 2015). "Meet Tamara Adrián, Venezuela's Crusading Trans Politician". Retrieved 26 December 2016. ^ Author, Constance Leisure; Provence', 'Amour (2 June 2016). "Meet The French -- And Female -- Donald Trump". Retrieved 26 December 2016. ^ "Classement Licence Droit, top 10 2016-2017 licence Droit". Retrieved 26 December 2016. ^ "Classement Licence Droit/Anglais, top 5 2016-2017 licence Droit/Anglais". Retrieved 26 December 2016. ^ Eduniversal. "Classement Eduniversal des Meilleurs Masters, MS et MBA". Retrieved 26 December 2016. ^ French National School for the Judiciary, p. 7. ^ Media, Prisma. "Droit, économie, gestion : les 20 meilleures universités en France". Retrieved 26 December 2016. ^ "Ces universités qui font trembler les grandes écoles". Retrieved 26 December 2016. ^ "Portrait de fac : l'université Paris 2 – Panthéon-Assas". Retrieved 26 December 2016. ^ "Université Paris 2 : fondés ou pas, les clichés sur Assas ?". Retrieved 26 December 2016. ^ "Paris 2-Assas : trois parcours pour la licence de droit". Retrieved 26 December 2016. ^ "L'Université Panthéon - Assas, un symbole de l'excellence Made In France - Monde des grandes écoles et des universités". 20 May 2015. Retrieved 26 December 2016. ^ Review report of the French Research and Higher Education Evaluation Agency (AERES), 2013, p. 7. ^ "Exposition Virtuelle : Jean Carbonnier". Retrieved 26 December 2016. ^ "Hommage à Gérard Cornu - Thèmes et commentaires - 11/2009 - Editions Dalloz". Retrieved 26 December 2016. ^ "Wikiwix's cache". Archived from the original on 27 August 2009. Retrieved 26 December 2016. ^ "Jean Carbonnier". Retrieved 26 December 2016. ^ enseignementsup-recherche.gouv.fr, ESR :. "Hommage au juriste Pierre Catala - ESR : enseignementsup-recherche.gouv.fr". Retrieved 26 December 2016. ^ "François Terré : " La réforme est marquée par une recherche d'équilibre dans les relations contractuelles "". 15 January 2014. Retrieved 26 December 2016. ^ Bongiovanni, Bruno; Cassese, Sabino; Castronovo, Valerio; Graziano, Manlio; Merger, Michèle; Mileschi, Christophe; Negri Zamagni, Vera; Pasquino, Gianfranco; Rampini, Paolo; Romano, Sergio; Toscano, Alberto; Verdura Rechenmann, Daniela (2004). L'Italie aujourd'hui: situation et perspectives après le séisme des années 90 (in French). Éditions L'Harmattan. p. 179. ^ International Court of Justice. Yearbook 1994–1995. p. 32. ^ Avlonitis, Alexandros (2 July 2009). "Boutia kai pali stin epetirida" [Dive back into the yearbook]. Ethnos (in Greek). ^ Oberlé, Thierry (11 December 2008). "Pavlopoulos, un ministre de l'Intérieur dans la tourmente". Le Figaro (in French). ^ Perrin, Olivier (January 21, 2014). "Une " maire courage " pour réconcilier ses enfants de République centrafricaine". Le Soir (in French). Adams, Geoffrey (2006). Political Ecumenism: Catholics, Jews and Protestants in de Gaulle's Free France, 1940–1945. McGill-Queen's University Press. Arrêté du 2 octobre 1990. Arrêté du 6 janvier 1926. Bellamy, Olivier (2011). Martha Argerich: die Löwin am Klavier (in German). Edition Elke Heidenreich. ISBN 978-3570580233. Berstein, Serge (1993). The Republic of de Gaulle, 1958–1969. Cambridge University Press. ISBN 978-0521252393. Bordier, Sophie (2 October 2006). "Mention bien à la fac de Melun". Le Parisien (in French). Bras, Jean-Yves (2006). Carlo Maria Giulini (in French). Bleu nuit. ISBN 978-2913575813. Chesnel, Sandrine (3 January 2008). "Choisir la meilleure fac de droit". L'Express (in French). Conac, Gérard (2005). "La fondation de l'université Paris I : François Luchaire, pilote d'une transition institutionnelle". In Bougrab, Jeannette; Maus, Didier (eds.). François Luchaire, un républicain au service de la République (in French). Publications de la Sorbonne. ISBN 978-2859445157. D'Agostino, Salvatore (1988). Università e territorio: squilibri e strategie di superamento (in Italian and French). Guida Editori. De Brancovan, Mihaï (January 1973). "Les concerts à Paris". Revue des deux mondes (in French). De Brancovan, Mihaï (April 1973). "Les concerts à Paris". Revue des deux mondes (in French). Décret no 70-246 du 21 mars 1970 relatif à la mise en place des universités (in French). Desmons, Gilles (2008). Walking Paris (4th ed.). New Holland Publishers. ISBN 978-1847730619. French National School for the Judiciary. Profil de la promotion 2008 (in French). Fourquet, Thomas (2013). Que faire avec un bac S (in French). L'Étudiant. ISBN 9782817602592. Genette, Gérard (2009). Codicille (in French). Seuil. ISBN 978-2021010336. Giles, Robert H.; Snyder, Robert W., eds. (1998). 1968: Year of Media Decision. Transaction Publishers. ISBN 978-1412815994. Hottin, Christian (1999). Universités et grandes écoles à Paris : les palais de la science (in French). Action artistique de la ville de Paris. Le Ray, Éric (2009). Marinoni: le fondateur de la presse moderne (1823–1904) (in French). Éditions L'Harmattan. Loi no 68-978 du 12 novembre 1968 dite « Edgar Faure » d'orientation de l'enseignement supérieur (in French). Marshall, James D., ed. (2004). Poststructuralism, Philosophy, Pedagogy. Kluwer Academic Publishers. ISBN 978-1402026027. Mathieu, Lilian (2008). "Les manifestations en mai–juin 68". In Damamme, Dominique; Gobille, Boris; Matonti, Frédérique; Pudal, Bernard (eds.). Mai-juin 68 (in French). Éditions de l'Atelier. ISBN 978-2708239760. Mayrargues, Samuel (2012). Jean Dujardin: du café-théâtre aux oscars, l'itinéraire d'un "gars normal" (in French). Éditions Balland. Nadeau, Jean-Benoît; Barlow, Julie (2005). Pas si fous, ces Français ! (in French). Seuil. Orchestre de Paris (in French). Hachette/Van de Velde. 1987. ISBN 978-2858680214. Oswald, Godfrey (2008). Library world records (2nd ed.). McFarland & Company. Pudal, Bernard (2008). "Les événements de mai et juin 1968 : bref récit chronologique". In Damamme, Dominique; Gobille, Boris; Matonti, Frédérique; Pudal, Bernard (eds.). Mai-juin 68 (in French). Éditions de l'Atelier. ISBN 978-2708239760. Readings, Bill (1996). The University in Ruins. Harvard University Press. ISBN 978-0674929531. Rey-Lefebvre, Isabelle (13 August 2012). "Paris-II-Assas, première faculté à offrir une prépa privée à l'examen d'avocat". Le Monde (in French). Sérès, Aude (September 19, 2013). "Assas lance une licence de droit en ligne". Le Figaro Étudiant (in French). This page was last edited on 12 April 2019, at 11:25 (UTC).